My love for scones is a little ridiculous. They are just too good. And these are so festive! 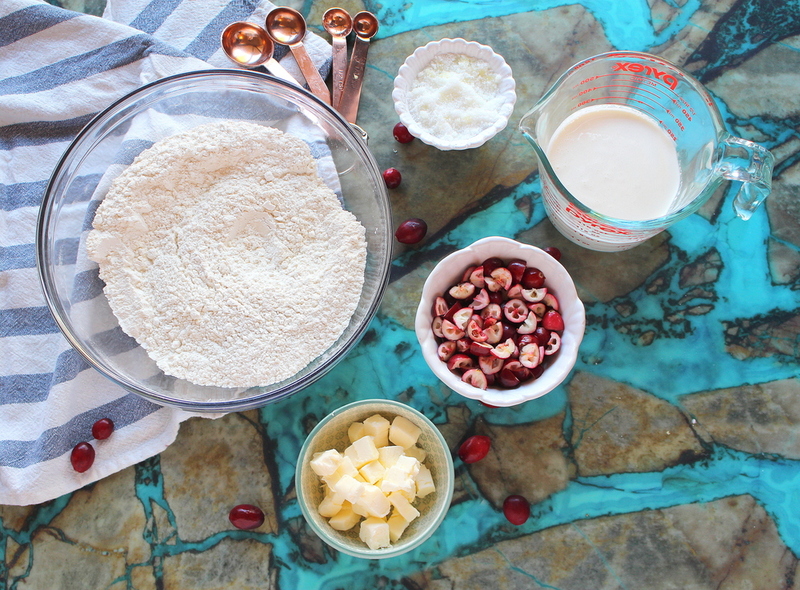 I wanted to use fresh cranberries in these because they are in season, and are so good. It's a nice tart punch to the sweeter scones. I also used fresh ginger in these, I rubbed it into the sugar to infuse the flavor. And then sprinkled the ginger sugar on top of the scones too. I have quite a few recipes coming your way too. Since I am officially on school break (YASSS) I am going to bake my little heart out. Plus Christmas is coming up, and I am all about Christmas baking. These would be perfect for Christmas morning, or right now, whatever floats your boat. In a small bowl mix the ginger into the sugar, using your fingers to rub the ginger into the sugar to infuse the flavor. Take out about 2 tbsp of the sugar to top the scones with and set aside. In a large bowl mix the flour, ginger sugar (not the 2 tbsp amount), baking powder and salt. Using your fingers incorporate the butter into the flour mixture. Some bits of butter will be the size of peas and others the size of oat flakes, this is perfect. Gently stir in the cranberries. Now add the cream and stir until until the cream is incorporated. Dump the shaggy dough onto a floured surface and knead a few times until it just comes together. Pat into a circle about an inch thick or so, and cut into wedges. Place the scones on a baking sheet lined with parchment. Put them fairly close together, like the picture above, and the will puff up more. Let the dough rest for about 10 minutes, then sprinkle the remaining ginger sugar on top. Bake for 10-12 minutes, or until puffed and golden. Serve with butter and jam, and enjoy!